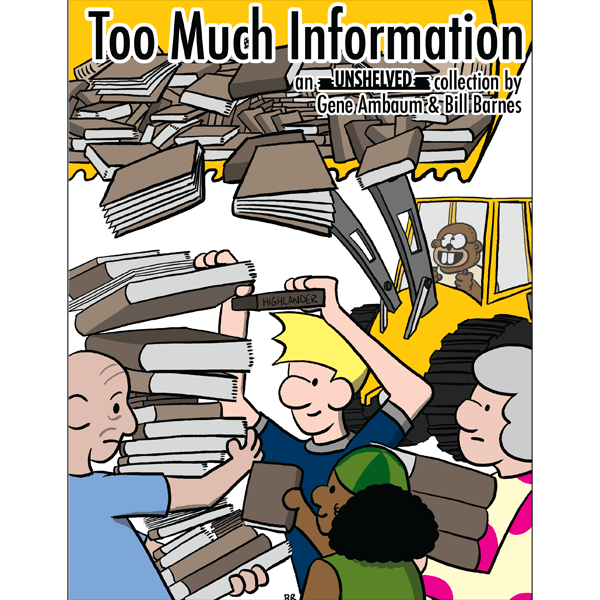 In January Overdue Media released the eleventh compilation of the Unshelved web comics that chronicles the daily misadventures of Dewey and his co-workers at an American dysfunctional library. Reads well with others compiles the comics strips originally published on the website between April 1st 2013 and September 25th 2014, as well as the “Conference Tips” originally published in ALA CogNotes newspapers in June 2014, January 2014 and June 2014. The Unshelved web comics is very dear to my heart despite the very average quality of the drawings (although it’s probably quite good for a web comics). The reason for that is quite simple: I work in a library myself and I can recognize in those strips situations I’ve found myself in so many times. Believe me, it’s much better to choose to laugh about it than go insane! The quality of the strips is improving with each new volume, but unfortunately the novelty of the concept wear off so it’s not uproarious anymore. However it’s still quite funny and entertaining to read (maybe less if you don’t know well the library domain). Again, like the last couple of books, I deplore that they haven’t included the “Unshelved Book Club” pages, but at least now the book is 120 pages in full color. You can choose to read the comics for free online, but personally I prefer the convenience of having a real book in my hands (and it offers encouragements to the creators). This should be a mandatory reading for all library staff! Unshelved Vol. 11: Reads well with others, by Gene Ambaum and Bill Barnes. Seattle, Overdue Media, January 2015. 22.5 x 17 x 1 cm, 120 pgs., $11.95 US / $15.95 CDN. ISBN-13: 978-1-937914-06-6. 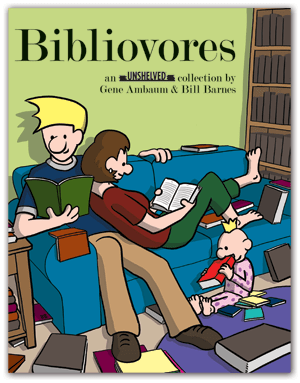 For readers of all ages. Reads well with others © 2015 Overdue Media LLC. All rights reserved.